As a significant milestone, Bosch Eyecare Solutions entered a partnership with Columbia Asia Hospitals wherein Bosch Eyecare will be part of a first-of-its-kind program in India where a multi-specialty hospital will be providing a comprehensive in house Diabetes management program. 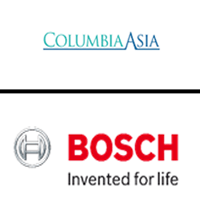 Strong proposition was made as to how Bosch can bring long term value to Columbia Asia hospitals not just as a mere service provider but as a business partner. The inherent features of the device like the quality of images, simplicity of usage, and telemedicine feature (which enables sending the images to the specialist for diagnosis) that showed a treatment based approach rather than just imaging the patients, made a significant mark with Columbia Asia. Presence of a strong Bosch service network throughout the country and the ability to deliver the units on a fast track mode resulted in the partnership. The company believes in setting up mid-size hospitals built in residential areas for accessibility and efficiency, and to better serve respective communities. This also helps keep costs down for consumers with no compromise on healthcare quality, modern amenities and highly-trained teams of specialists and nurses. Sightsavers is an international organisation working in more than 30 countries with a mission to eliminate avoidable blindness and support people with visual impairments. Started by John Wilson, Sightsavers came to India in 1966 and this year marks the 50th anniversary of the organisation. The portability of the Bosch solution makes it very easy for Sightsavers to deploy this system to their vision centers and partner hospitals. Image taking is simple (non-mydriatic) hence training the staff (which sometimes comes from the local community) is easy. With the help of telemedicine, Sightsavers has tied-up with partner hospitals to enable a treatment based approach rather than just imaging patients. This has ensured last mile delivery of eye care at remote parts of the country. The Bosch solution has already been bought by Sightsavers’ partner hospitals in the past in areas like Patna, Kolkata and Chennai. Bosch had also engaged Sightsavers in partner meets for creating awareness about Diabetic Retinopathy and eye screening with the Bosch EyeCam. Mr. R N Mohanty, CEO Sightsavers India, said “the Bosch fundus camera was tested by us in our urban strategy and we are currently looking at a larger implementation within 8 states and 20 cities that are of focus for us. With a technology partner like Bosch we will look at a model that interlinks multiple stakeholders like the government, NGOs, and private players working for a social cause towards creating an impact” Ms. Carolione Harper, CEO Sightsavers International was impressed by the Bosch portfolio. “This is an extremely interesting partnership, which once starts to see great results in India, we would like to look at how we can work with Bosch right across various countries we’re already working in”, she remarked. Dattatri Salagame, Vice President- Strategy, Innovation and New Business Themes, talked about software and technology being the enabler for providing affordable last mile delivery of eye care to both urban and rural India. Bosch emphasized its commitment towards building technology which can detect a wider range of eye diseases. Both organisations foresee a long-term engagement and the deployment of Bosch Eyecare Solutions across Sightsavers’ partners in India in the time to come. Today, the scope of deployment is within India, but the future is full of opportunities and does not limit exploring international territories.